KEEP YOUR FEET MOVING – Agility skating is the ability to move the body quickly in multiple directions. Forwards are told to keep moving in the offensive zone and on the rush, in order to challenge the forwards and defend their net, defencemen must be agile skaters and keep their feet moving at all times. Being flat footed and stationary is a recipe for disaster. By keeping the feet moving, knees bent, shoulders back and eyes up you are in the “ready position” and prepared to face any challenge that is presented. When defending any even man situation, the D man must have a good gap (distance between the puck carrier and the checker)—an ideal gap is at least 1.2 to 2 stick lengths. Being in the ready position with the feet moving allows the defenceman to control the gap. READ THE PLAY – Always keep a “head on a swivel”, this helps with awareness of what is going on around the player. Defencemen have a north view of the rink, and will face all kinds of scenarios when accepting the rush, reading the situations and reacting accordingly is key. Is the situation the D man is facing a 1 on 1, 2 on 1, 2 on 2, 3 on 2, 3 on 3, are there back checkers tracking back? In the defensive zone, is the opposing forward facing the corner, can you beat him to the puck, is he coming at you with speed, do you have a support forward behind you, is your partner in front of the net? PLAY INSIDE THE DOTS – The rink inside the rink. The idea when defending in hockey is to keep body positioning between the man and your net, often referred to as keeping the “defensive side”. I like to refer to it as a “net/you/man” relationship with the offensive player. Coaches also make reference to “protecting the house”, in other words, protecting the area around your net and keeping puck carriers and shots to the outside. 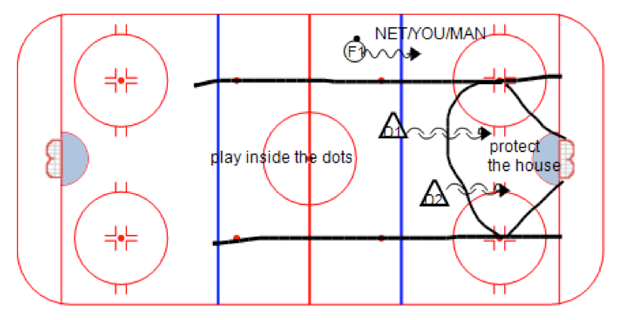 Defencemen can reach such objectives by playing “inside the dots”. When playing inside the dots, the objectives of maintaining defensive body positioning and protecting the house are achieved. STICK ON ICE/STICK ON PUCK/BODY ON BODY – The key objective when defending is to strip the puck carrier of the puck, get into passing and shooting lanes and take away the opponent’s time and space. Defencemen need to keep their sticks on the ice at all times and when defending the puck carrier, keeping one hand on the stick attempting to keep their stick blade on the puck for as long as possible. By keeping their stick on the puck, the defender can poke the puck off the puck carrier’s stick and discourage the puck carrier from passing or shooting. 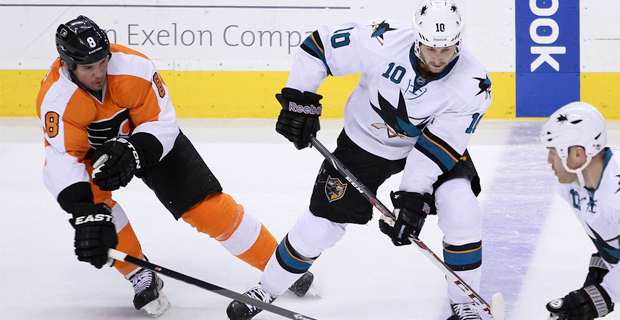 While keeping the concept of “stick on puck”, the defender should maintain a body focus. If the defender misses the attempt to poke check the puck carrier, he can still impede his progress and strip him off the puck by playing his body. The defender uses his peripheral vision to watch the puck and maintain a “body focus”. 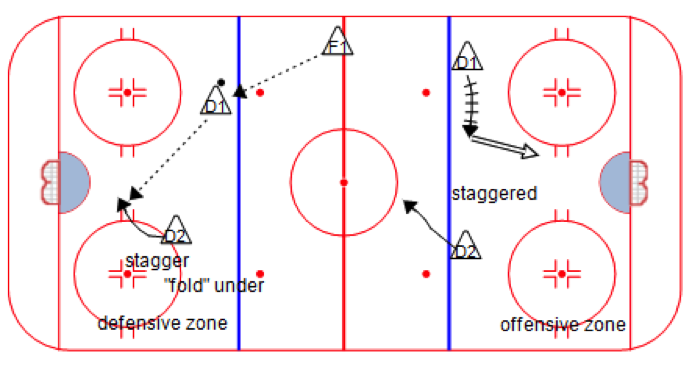 STAY STAGGERED – Next to the goaltender, the defencemen are the last line of attack. Defencemen should never be even with each other, whether on offence or defence. If you are playing in a staggered position, if there is a turn over or your partner gets beat, you are there for defensive support. Two examples: in the offensive zone, a strong side D man is going in for the pinch or in taking a shot, his partner must play outside the blue line, inside the dots, close to the middle of ice and ready to defend, should his partner get beat he is there to defend. The second example is in a regroup situation, you pass the puck to your partner, after the pass your job is to “stagger” and drop in behind your partner. Again, if the puck is turned over you are in position to defend and if your partner needs to pass the puck back to you, you are in a difficult position for the opponents to check you. COMMUNICATION – A key to the game of hockey is on-ice communication. Be the eyes for your partner, yell loud; let each other know what is happening on the ice. Communicate with your partner at practice and off the ice. Communicate with the goalies on puck placement on a dumped-in puck, let the forwards know who they should pick up on rush coverage. Hockey must not be played in the library—be heard! WIN ALL YOUR BATTLES IN GAMES AND PRACTICES – Take pride in being a defenceman, win all your 1 on 1 battles, be intense and be strong on your feet. Keep your feet moving and be quick into the corners. Take the time to practice individual skills and be mindful of the 7 rules of defensive hockey for defencemen.